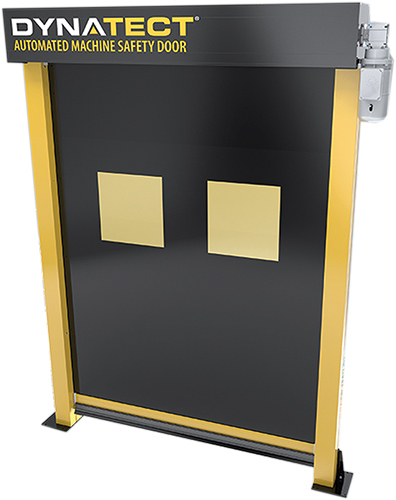 The Gortite VF door from Dynatect Manufacturing, Inc., New Berlin, WI, is a high-speed, automatic roll-up door intended for safety in machine guarding and automated work environments. It separates hazardous processes from people and equipment. Also, it can contain process-driven hazards such as weld sparks, fluid splatter and debris. By eliminating the extra buffer needed for light curtains to create a safety zone, the barrier created by the Gortite VF Door minimizes the impact on available machine floor space. Key specs: customer-specified door-opening height and width of 3 to 16 ft.; 44 in./sec. standard speed; numerous sensor and switch options; continuous operation at as many as two complete cycles per minute; and optional traveling photo-eye (bottom-edge sensing and reversing).